Greenup High School "Blue Devils"
Greenup High School Athletic "Letter"
Greenup (population 1,532) is located in southeastern Illinois in south-central Cumberland County. Interstate Highway 70, U.S. Route 40, Illinois Route 130, and Illinois Route 121 all travel to and from Greenup. The Embarras River runs to the north of Greenup. The Conrail Railroad has railroad tracks that run through Greenup as well. A town of note for location purposes might be Effingham, located 20 miles southwest of Greenup. The history of the town and its school system goes back many decades. It is said that Greenup had a school building in 1840 (http://www.Cumberland.K12.il.us/DistrictInfo/History/History.htm). A two story brick building was built in Greenup in 1876 for $3,478. This building served the community until 1896, when fire damage forced its destruction. A new, two-story, eight-classroom school was immediately built as a replacement and it stood tall and proud until its demise int he 1960s. In 1908 an addition to the school was added and in 1927 a gymnasium added. Additional annexes of a bandroom and cafeteria were later made. The building eventually served "all eight grades and a high school". The first high school graduating class at Greenup High was the Class of 1890. 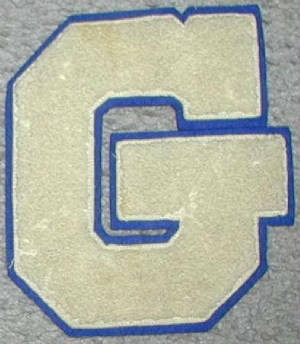 The final graduating class was the Class of 1949. It was in this year that the towns of Cumberland County agreed to consolidate their School Districts. Greenup, Jewett, and Toledo High Schools became Cumberland High School in 1949 with the school located on Illinois Route 121 between Toledo and Greenup. As stated above, the original school building in Greenup was demolished in the 1960s. For we know you have sand, Greenup High! So crack out the ball, Greenup High. We're backing you all, Greenup High. Victory from you Greenup High! Greenup High School experienced IHSA success in boys basketball. It is assumed baseball and track were also offered at Greenup High. The team nickname and school colors are being sought. The boys basketball program at Greenup High had a great run in the mid to late 1930s. Included was two District titles and a Regional title (1935-36) which put the Greenup boys as one of the top 64 teams in the State!!. Team records and coaches names of these and other great Greenup High School teams are not available.